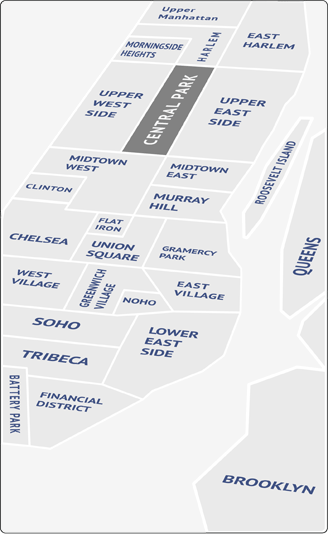 Close to Flatiron, Gramercy and Greenwich Village, Union Square is of the main hubs in Manhattan. It extends from Broadway on the west side to Madison Avenue on the east, 14th Street on the south side to 17th Street on the north. It’s next to everything that makes living in Manhattan such a unique experience: amazing restaurants, beautiful parks and a huge variety of shops. Like Gramercy right above it, Union Square is filled with prewar spaces, many of them large, sun drenched lofts. The spaces are in high demand, so don’t expect the deal of a lifetime here. Great eating can be found all over Union Square, from the luxury of Union Square Café (consistently rated readers’ favorite by the Zagat guide) to down-home comfort food at Chat ‘n Chew. And if you get tired of what’s in the square, you’re not far from places in nearby neighborhoods like Gramercy and the Village. Irving Plaza, a block east of Union Square, is one of the most popular music venues in the city, and De La Guarda, with its high-flying aerobatics, has a long-term home on Union Square East and 15th Street. With its close proximity to the East Village, you’re never far from other small theater and music attractions, not to mention the endless supply of funky boutiques. Union Square is one of the coolest places to hang out and people watch. In the evening, nine-to-fivers the city over congregate here to watch the musicians, political kooks and skateboarders do their thing. And four days out of the week, a farmer’s market sets up shop on the western side of the square. A little farther north, Madison Park is considered by many to be the most beautiful small park in the city. There’s not a lot of room for new residential construction, so expect demand to stay high for places in this highly sought after location.